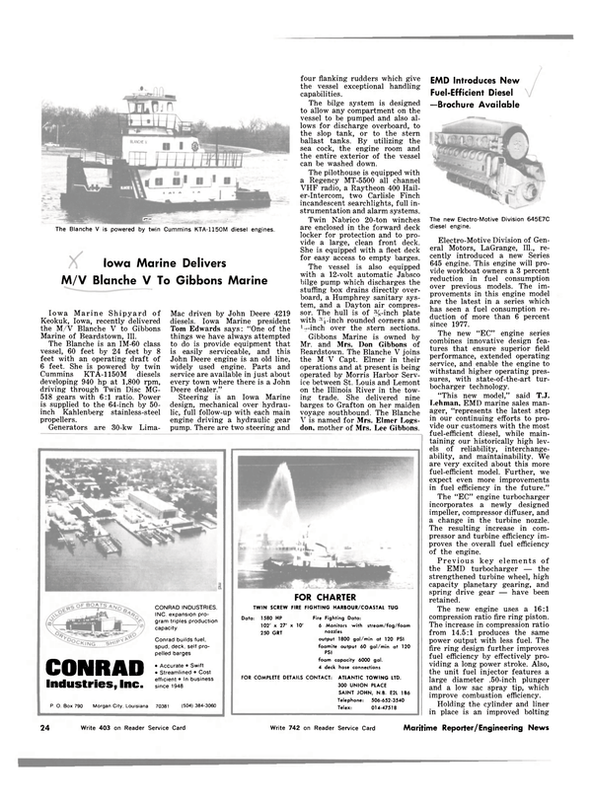 Todd Shipyards Corporation, New York, N.Y., recently reported higher sales and earnings for its third quarter and 39 weeks ended December 26, 1982, compared with the same periods a year ago. John T. Gilbride, chairman, attributed the improved results to increased revenues from continued construction of guided missile frigates (FFGs) for the U.S.
Navy, which more than offset lower naval repair sales and a decline in commercial ship repair work reflecting reduced international and domestic shipping activity on all three coasts. Sales in the third quarter of fiscal 1983 amounted to $201.5 million, compared with sales of $180.9 million in the same fiscal 1982 period. Third quarter net income totaled $8.8 million, or $1.85 per share, compared with earnings of $7.6 million, or $1.46 per share, in the same 13-week period last year. Sales for the first 39 weeks of fiscal 1983 were $595.7 million, compared with $536.8 million in the same period in fiscal 1982. Net income amounted to $25.0 million, or $5.09 per share, a gain of 9.9 percent over earnings of $22.7 million, or $4.26 per share, in the fiscal 1982 39-week period. In the first nine months, Todd's ship construction revenues rose 22 percent over last year's figure as a result of the guided missile frigate (FFG) program. The company has received contracts for the construction of 30 FFGs, of which 15 have already been delivered. Five FFGs were delivered to date in fiscal 1983, the most recent of which, the Reid (FFG- 30), was delivered on December 30, five weeks ahead of schedule and below budget. The company expects to deliver all 15 FFGs still under construction by its Los Angeles and Seattle divisions ahead of schedule and below budget. Naval repair sales, although lower than in last year's first nine months, showed improvement in the third quarter as Todd continued to aggressively compete for new business to more fully utilize its expanded West Coast repair capacity. The newly acquired San Francisco facility has contributed a $50-million shiprepair backlog since November 1982. "San Francisco's excellent facilities, featuring a mammoth 65,000 displacement ton drydock and those of Seattle and Los Angeles, put Todd in a strong competitive position to obtain additional naval work, which is expected to increase as the Navy's new homeporting dispersion policy is implemented in these three leading Pacific Coast ports," Mr. Gilbride noted. The company's commercial ship repair revenues declined approximately 20 percent from last year's level, reflecting lower shipping activity.